Autumn Maple House is a completely remodeled 1500 square feet 3 bedroom one and a half bath Henrietta charmer. Close to so many amenities. Beautiful and quiet 22,000 sf lot with mature trees. Light and open floor-plan with fully equipped kitchen. New modern furniture including luxury memory foam mattresses for a good nights rest. Ideal for a romantic hideaway or a family get together. Air conditioner in each bedroom and living room. Front- load washer and dryer. Enjoy Roku programs and movies on your 50” High Def TV & Netflix. Melt the cold away in your Spa bathroom with steam bath and rainfall shower with body jets. 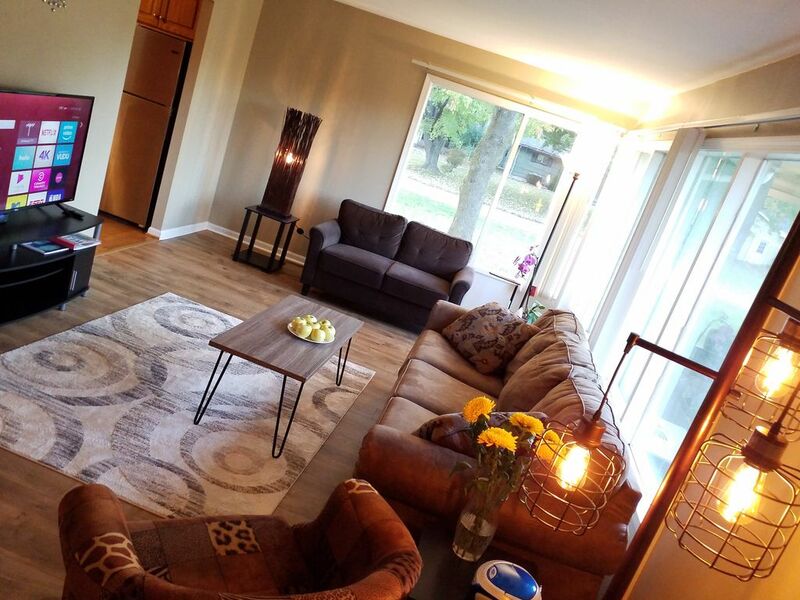 Autumn Maple House is a lovely home you'll want to book for all your Rochester visits! The property is located in the corner lot with 22,000 st of the green lawn with a couple huge maples. The living room has L shape windows to enjoy the beauty of stunning corner view. Tremendous green backyard with deck. It was perfect for our family of 6! The beds were comfy, and the house had enough room to spread out a bit. It was a great base camp for our vacation! Can’t wait to stay again! We travel to Rochester a few times a year because my son plays lacrosse with a local team. Up to now we’ve stayed in hotels, but never again! This home is so comfortable and offers us space to spread out. The beds are amazing memory foam mattresses...we all slept like babies! And the shower is fantastic! After playing lacrosse all day long, my son couldn’t wait to unwind in the shower. Close to everything..Wegman’s, restaurants, Pittsford Farms Dairy! The host checked in with us just to make sure we found everything to be to our liking :). We loved staying here! There was a very nice open area for the kids to play in, a back yard, and plenty of space. The shower was wonderful! Most of all the host was very thoughtful as well as organized and ready for our stay. There were copies of the manuals to the TV and shower emailed to us and in a neat little binder once we'd arrived. I was very impressed and we may stay there again sometime. Thank you so much for your so nice words. Hopefully we will serve you next stay in Henrietta. I'm sure Autumn Maple House will be much more interesting when you come back. One and half hours from Niagara Falls, Lilac Flower Festival in May, Jazz Festival in June, Strong National Museum of Play, Erie Canal, etc.